Junk food or drug addict? A study conducted by researchers of The University of Texas and Oregon Research Institute found that prolonged consumption of junk food results in reduced activity in the striatum, a section of the fore brain that registers rewards. In other words, people addicted to junk food require an increasing amount of it to reach the same "high" or pleasure, just like drugs. 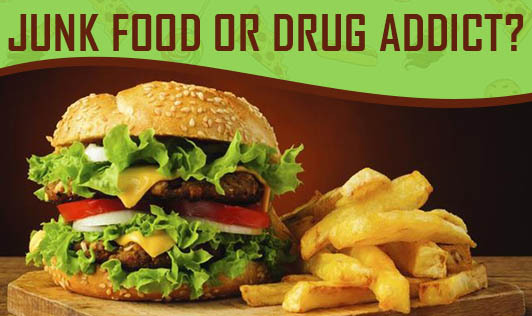 The brain function and activity was found to be the same in people who are on drugs and the ones eating junk food. It was found that the combination of fats, salt and sugar used in junk food makes it difficult for a person to stop eating even when they are full. These foods increase the appetite level instead of suppressing it, which leads to overeating. 1. Reduce the portion size: The key to overcome addiction is to reduce the quantity of food eaten, than to completely avoid it. 2. Have breakfast: Kick-start your day with a healthy, fibre-rich meal to delay hunger and control your sugar cravings. 3. Choose quality foods: Quality foods come at a price. When you do have a craving, buy expensive foods. That way, you can be sure of the quality and you won't be buying it too often. 4. Eat regularly: Avoid starving yourself. Eat frequent meals to keep your sugar levels stable and reduce your craving. 5. Go for alternatives: Choose low-fat yoghurts, dry fruits, sorbets, fresh and dry fruits, khakhra and theplas instead of ice creams, burgers and pizza. 6. Stop buying unhealthy snacks: When you have access to junk food, you will definitely end up eating it. So, make it a point to buy healthy snacks and keep them around.